An important element of the upcoming HLC Peer Review visit is an open session for staff. The team values this opportunity to speak to University staff to help validate the institution’s ability to meet the criteria for accreditation. With gratitude for the valuable work that you do and for your commitment to the University, I encourage you to confirm this session in your calendar on Monday, February 29. Information about the HLC accreditation process, including an overview, the criteria for accreditation, and the results of student opinion survey are located under Areas/HLC Accreditation on AceLink. An important element of the upcoming HLC Peer Review visit is an open session for faculty members. The team values this opportunity to speak to University staff to help validate the institution’s ability to meet the criteria for accreditation. With gratitude for the valuable work that you do and for your commitment to the University, I encourage you to confirm this session in your calendar on Monday, February 29. The University of Evansville will host a visit February 29 - March 2, 2016, with a five-person review team representing its regional accrediting agency, the Higher Learning Commission (HLC). Prior to visiting UE, the peer review team will spend several weeks carefully reviewing UE’s Assurance Argument, verifying assertions made in the argument by examining supporting documents provided in an Electronic Resource Room, and identifying people and groups with whom they want to meet while on campus. In addition to the materials provided by UE, the peer review team will also read any comments submitted to the HLC through the Third-Party Comment process and results of a survey the HLC administers to UE students six weeks prior to the campus visit. While on campus, the peer review team will likely spend time visiting various programs and departments, observing classrooms or co-curricular activities, and meeting with individuals and groups (including open forums with faculty, staff, and students). The HLC Steering Committee has developed a set of sample questions that peer review team members may ask, which is intended to be a helpful guide in preparing for the campus visit. Several weeks after the campus visit, the peer review team will prepare a draft report, which will be sent to UE to review and correct any errors of fact. The team will then prepare a final report of its findings and recommendations for UE’s accreditation status. UE will receive a copy of this report and have an opportunity to provide a formal written response to the HLC. This response will become part of the official record of the evaluation. The HLC will review the final report and UE’s response and notify UE in writing when the review process is completed and final action by the HLC has been determined. All Muslim students are invited to a prayer room meeting with University chaplain Tammy Gieselman today at 5:00 p.m., Grabill Lounge, Neu Chapel. (Grabill Lounge is located on the lower level of Neu Chapel). Please plan to attend this important, visionary gathering, and bring your UE ID for sign-up purposes. For more information: tg85@evansville.edu. There will be an artist book exhibit in Krannert Gallery today through March 30. The exhibit, "Findings and Bindings." The featured artist is Kimberly Jones. All are welcome to join us as we celebrate Mass on Sunday, February 28, at 1:00 p.m., in Neu Chapel. We hope to see you there! Please call/text Kristel at 812-760-8610 for more information! One of the most popular jazz groups in the Evansville region, the After Hours Ensemble, will present the next program in the Jazz Guest Artist Concert Series, co-sponsored by the University of Evansville and the Evansville Jazz Society. 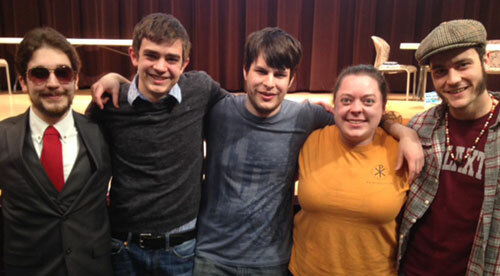 The concert will be presented in Wheeler Concert Hall on Sunday, February 28, at 4:00 p.m. The After Hours Ensemble includes some of the most outstanding jazz artists in the area, including Jonathan Hogan, saxophone; Chris Eans, trumpet; Matt Kincaid, guitar; Greg Martin, drums, and leader Michael Gray, bass. The group has been a mainstay of the jazz scene in Evansville for many years. Their concerts feature interpretations of jazz standards and original compositions. Admission to the concert is $15 for adults, $10 for Evansville Jazz Society members, and $5 for students with ID. Tickets can be obtained by contacting the UE Department of Music at 812-479-2754, or may be obtained at the door. For more information, contact emeritus professor Edwin Lacy at el2@evansville.edu or 812-488-2227. Opportunity to pray the Rosary! Looking for simple new ways to come closer to your faith this Lenten season? Join Newman Club members Nathan Kabat and Nicolette Fonseca for 20 minutes every Friday at 11:00 a.m. in Neu Chapel's first floor prayer room as they lead us in the Rosary! We hope to see you there! Please e-mail Nicolette (nf39@evansville.edu) or Nathan (nk78@evansville.edu) for more information! Do you love Chipotle? Do you want to support refugee children? Come to Chipotle today from 5:00-9:00 p.m., to show your support for refugee children in the Middle East and to have a great time! Present this flyer at the time of purchase, and 50% of your sales will go directly to support Road to Mafraq, a non-profit organization that works to increase access to education for children affected by conflict in the Middle East. All proceeds from this event will go toward building a science corner in a refugee camp in Jordan. 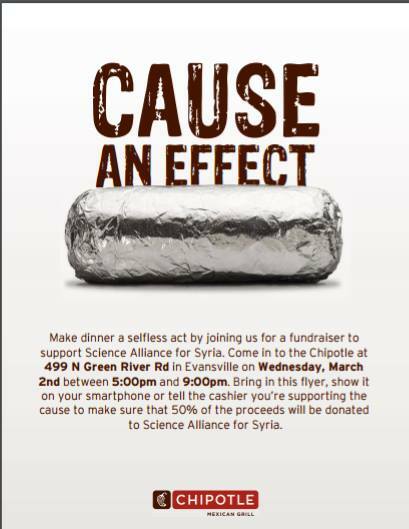 Science Alliance for Syria has organized this fundraiser for Road to Mafraq. Science Alliance for Syria is the joint project of UE science clubs including Society of Physics Students (SPS), Biological Sciences Club (BiSci), Environmental Concerns Organization (ECO), and Chemistry Club. The University’s housekeeping service, WFF, will have a job fair today until noon, in Eykamp Hall, Room 253, Ridgway University Center. Light refreshments will be served. This event is open to UE students and to the public. Anyone interested in a job with WFF is welcome to attend! WFF offers part-time work and flexible hours that are ideal for a college student's busy schedule. For more information, please call 812-488-2045. Students wishing to reside in one of the residence halls for 2016-17 should plan to attend one of the information sessions about the residence hall selection process. Meetings will be at 5:00 p.m. and 9:00 p.m. in Eykamp Hall, Room 252, Ridgway University Center, today. More information about the housing selection process can be found online here. Leadership Training Day for new members is on Sunday, February 28, from 1:00-4:00 p.m. in Room 162, Schroeder School of Business Building. Everyone is encouraged to bring their own drink. Snacks will be provided. Those unable to attend should please e-mail Jennifer Allen at ja225@ueliveevansville.onmicrosoft.com to set up a time to go through the training video. Remember all members must attend LTD as part of their requirements to be officially inducted in April. Students interested in purchasing a class ring are encouraged to meet with the Josten's Ring representative. The representative with be upstairs in Ridgway University Center today from 4:00-6:00 p.m. and also Tuesday, March 1, from 11:00 a.m.-2:00 p.m. at the UE Bookstore. Stop by and browse the selection and view promotion pricing. There's no obligation to purchase. Join us in the last week of celebrating 40 days of peace. Today's action: Reach out to one elderly person and make their day! High school changemakers, along with their coaches, will be on campus today for an optional coaching session, which will provide instruction on how to make a successful pitch. The Institute for Global Enterprise will be hosting the session with assistance from members of the Social Innovation Club from 4:30 – 6:00 p.m. in Room 162, Schroeder School of Business. Please help us welcome these future changemakers, and potential future Aces, to campus. Up to 14 schools from the EVSC and Warrick County School systems will compete in the final round of the challenge on March 17. The contest is intended to encourage local youth to think about ways they can affect positive change in our society. Each member of the winning team will receive a full-tuition scholarship to UE for four years. Interested in gaining media experience abroad? Join UE faculty, students, and alumni on a major archaeological dig in Israel this summer! The Jezreel Expedition is looking for a UE student to take photos and video and maintain Jezreel's social media presence during the 2016 dig season (May 27-June 24.) For more information, contact Jezreel co-director Jennie Ebeling, associate professor of archaeology, at je55@evansville.edu. Do you know what to recycle at UE? UE’s Environmental Management Facebook page. Continuing students should file the 2016-17 FAFSA (Free Application for Federal Student Aid) to apply for federal, state, and University need-based financial aid, including all federal student loans. UE's FAFSA code is 001795. You can file the 2016-17 FAFSA by March 10 at www.fafsa.gov. Submitting by March 10 is essential for Indiana residents and highly recommended for all. Questions regarding the FAFSA should be directed to the Office of Financial Aid in Room 116, Olmsted Administration Hall, or at 812-488-2364, 800-424-8634, or financialaid@evansville.edu. The IRS Data Retrieval Tool transfers parent and/or student IRS tax information into the FAFSA. The IRS Data Retrieval Tool is available through the FAFSA approximately three weeks after the 2015 federal tax return is filed electronically. IRS Data Retrieval can be used for the initial FAFSA or to correct estimated tax information on a submitted FAFSA. Thanks to Campus Community for making Nerd Wars a success! Thank you for making the Honors Program Nerd Wars a success! Attendees and spectators enjoyed the fun and food sponsored by funds from the Student Government Association. Prizes were awarded to the winning student team, Shuck It Trebek (Josh Best, Joey Estes, Cameron Roberts, Caroline Kopff, and Alex Schmitt) and the winning faculty/administrator/staff team, Consilience (Associate professor of biology Joyce Stamm, associate professor of biology Ann Powell, assistant professor of English Robert Baines, associate professor of history Dan Byrne,and associate professor of physics John Stamm). The Nerd Wars trophy grand prize went to Consilience, the team with the most total points. $619 was generated from the event and given to Honors Ace Mentors (HAM). HAM is a UE student volunteer outreach program administered by the Honors Program/HAB to provide tutoring, cultural enrichment, and mentoring for grade school through high school students in the Evansville Vanderburgh School Corporation. The Purple Aces Tennis 2016 Spring Fundraiser is set for March 5 at 6:00 p.m., at the Tri-State Athletic Club, located at 555 Tennis Lane, in Evansville. Join the Aces Women’s Tennis team for an evening of fun, food, prizes, a silent auction, and – of course – tennis! To sign up, contact Don Martin at 812-479-3111.